Basically in the beginning it has to be said that besides herbivorous snails there are also omnivorous and carnivorous species (see: Snails: Morphology: Feeding). 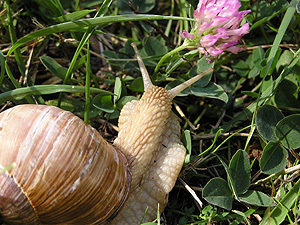 In the following, however, we would like to describe the food habits of our domestic herbivorous species, that can easily be kept in a terrarium, such as Roman snails (Helix pomatia), brown garden snails (Cornu aspersum), banded snails (Cepaea nemoralis and Cepaea hortensis), as well as different other species. Whereas Roman snails are reported to prefer withered food, this has not been able to be confirmed during terrarium tests. Also the feeding behaviour of snails is largely dependent on how hungry the snails are. Hungry snails are certainly less choosy than well fed ones. 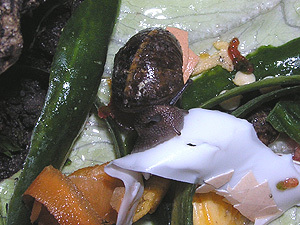 Between Roman snails (Helix pomatia), brown garden snails (Cornu aspersum) and banded snails (Cepaea) distinct differences could be observed in their finding food. Roman snails are very slow and unhurried. Usually they find food only when they are directly in contact with it. Brown garden snails, on the other hand, usually are much faster and more agile, and so are banded snails. The often crawl through all of the terrarium, to acquire food. Additionally, the interesting phenomenon has been observed that snails tend to keep company when feeding, as they do in other situations. So sometimes several common brown garden snails feed on one piece of food together, even if there are other food sources available. 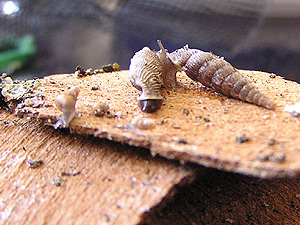 It is recommended that terrarium keepers offer different food sources to their snails. 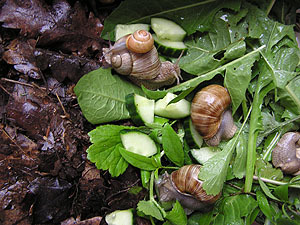 There are vegetables and herbs that snails almost always feed on, such as cucumber. But even those lose their attraction, if they are offered at all times. Other vegetables are only taken at certain times of the year. So it could be seen that Roman snails do feed on parsley, but only in spring, not in the rest of the year. Basil will be eaten by snails also only part of the year. Concerning wild plants the feeding behaviour of snails can also be very different. Clover is a favourite snail food, but dandelion is not. Grasses are eaten only as an exception, which may be due to their high silicate content. The leaves of nettles also are quite popular. Of many vegetable species the leaves can be fed to snails. So cabbage turnip leaves are likely to be eaten and so are the leaves of carrots and radish. Carrots themselves can also be fed, best in halves, which also are eaten by all described snail species, as then it is easiest to reach the tasty inner parts. Kitchen waste from vegetables can be fed as well, for example aubergine peels, tomato slices, cucumber peels and so on. A completely other form of snail food is oatmeal, which is also taken by all described snail species (when soaked in water). Oatmeal also can be used to feed juvenile snails, as well as snails, that usually feed on algae, such as door snails (Clausiliidae). But oatmeal should not be fed all the time, otherwise the snails will soon lose their appetite. Whereas Roman snails (Helix pomatia) are strict herbivores (which has been proven numerous times in the terrarium, so the idea of Roman snails feeding on slug eggs has to be banished to the reign of fables), brown garden snails are much more flexible. On one hand they not only feed on egg shells provided as a calcium source, but also the boiled white of egg inside. On the other hand they will also take occasional gifts of mince meat. Brown garden snails have even been observed feeding on cat food from the cat's bowl. As a gift of calcium, apart from egg shells, also a cuttlebone can be provided from the animal shop. The cuttlebone should be offered with the coated side down. Brown garden snails will eat it as noisily as they will eat it completely. Tomato yes yes yes ? Carrots yes yes yes ? Cabbage turnip leaves yes yes yes ? Carrot leaves yes yes yes ? Aubergine peels yes yes yes ?